It was calm balmy evening wherein an attempt was made to unravel the richness of the Scindian life through a cultural evening on 16th April 2016. The august gathering included Principal; Dr. Madhav Deo Saraswat, Guest of Honour, former Principal, Mr. N K Tiwari and his family, Mrs Nishi Mishra; Principal, SKV, Bursar, Colonel Sanjiv Kaushal and prominent Old Boys; Mr. Aman Jyoti Bindal, Mr Harish Bhojwani and Mr. Praveen Bhargava. The Principals of some renowned schools from Gwalior also graced the occasion. The talent displayed by the boys showcased their passion and enthusiasm. The evening began on a musical note as it announced the revival of The Scindia School's indigenous rock band Psy'x' which was formed in the year 2002. Arbin Das, Jagjeet Jain and Rhythm Kukreja sang `Take It Easy’ by Eagles, `Wonderful Tonight’ by Eric Clapton,`Country Roads Take Me Home’ by John Denver and `Emptiness’ by Rohan Rathore. The melodious vocalists were accompanied by Kaldenla Bhutia, Jagjeet Jain, Pratham Dalmia and Nitesh Thakuri. They mesmerized and enthralled everyone as they presented a rainbow of melodious compositions. 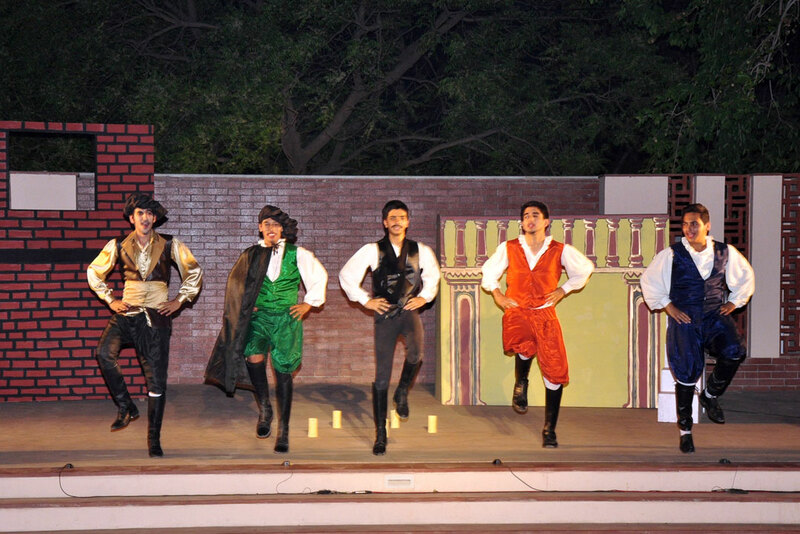 Then The Scindia School Theatrical Society presented William Shakespeare’s most famous romantic drama, 'Merchant of Venice'. It was written between 1596 and 1598 and popular for its most dramatic scenes, iconic characters and signature dialogues. The play was directed by Mr Abhinav Goyal, Mr Nikhil Raj Sharma and Mr Amish Rajawar. The audience was transported into 16th century Venice with spectacular sets, fantastic costumes and great histrionic skill. Rishab Goswami gave an exemplary performance as Shylock. Abhijeet Nagpal was convincing as Bassanio whereas Aadya Mishra did full justice to her role as Portia. Arjun Mehrotra performed his role as Antonio with full conviction. The supporting cast also performed brilliantly. Then the grand finale was presented in the form of a Band Concert by the members of the School Brass Band. It began with `Drums Call’. The boys played various tunes with perfection tune under the guidance of Mr Ramesh Sharma. Some popular tunes were Fanfare, Donauwellen-Walzer, Blessings of God,Chariots of Fire etc. It was indeed a scintillating performance. At the end Guest of Honour, Mr NK Tewari felt that in one beautiful enchanting evening he witnessed a display of varied expertise. Mr Tewari applauded the rock band, Shakespearian play and the phenomenal brass band display. He felt that the overall impact of the play was exceptional. Mr Tewari complimented the team behind the scenes and the performers on the stage. He specially congratulated the commendable performance of Shylock. Mr Tewari expressed his gratitude to Mr Ramesh Sharma for instructing the boys to play two of his favourite tunes. At the end Mr Tewari felt that in such a small evening he could perceive that the students get an opportunity to select what they like the most and actually enjoy what they do. In all the entire mesmerizing evening was thoroughly appreciated by everyone. Click here to see event photographs.